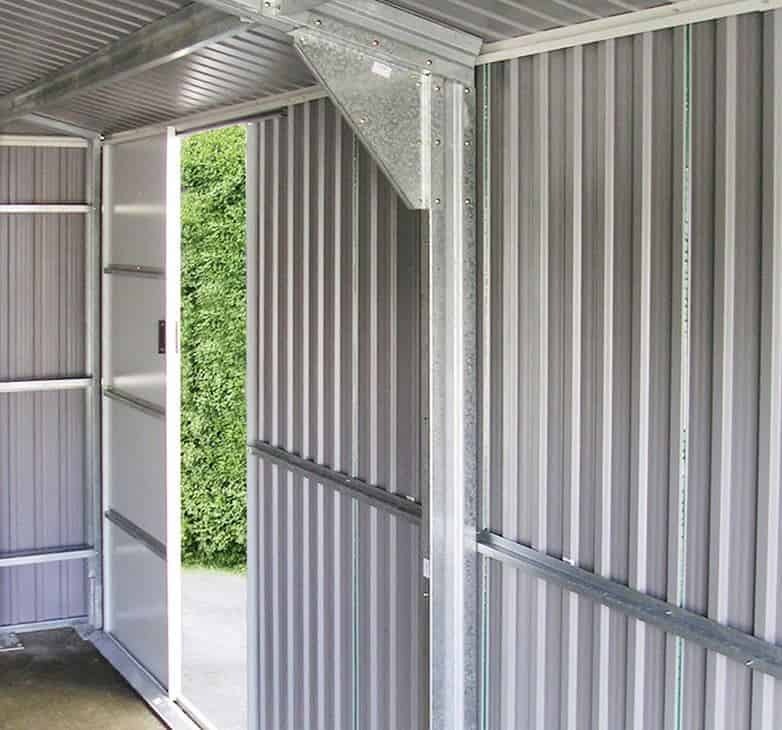 If you’ve been thinking about the benefits of installing a large metal garage on your property, but are worried about it standing out because of its grey or silver metallic appearance, then this could be just what you want. Finished in what we find to be an attractive shade of green, with some white trim as well, it fits into a garden environment and can even become a feature or talking point. 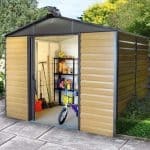 One feature that you’re sure to appreciate is its size, as it’s one of the largest metal buildings that we’ve reviewed. 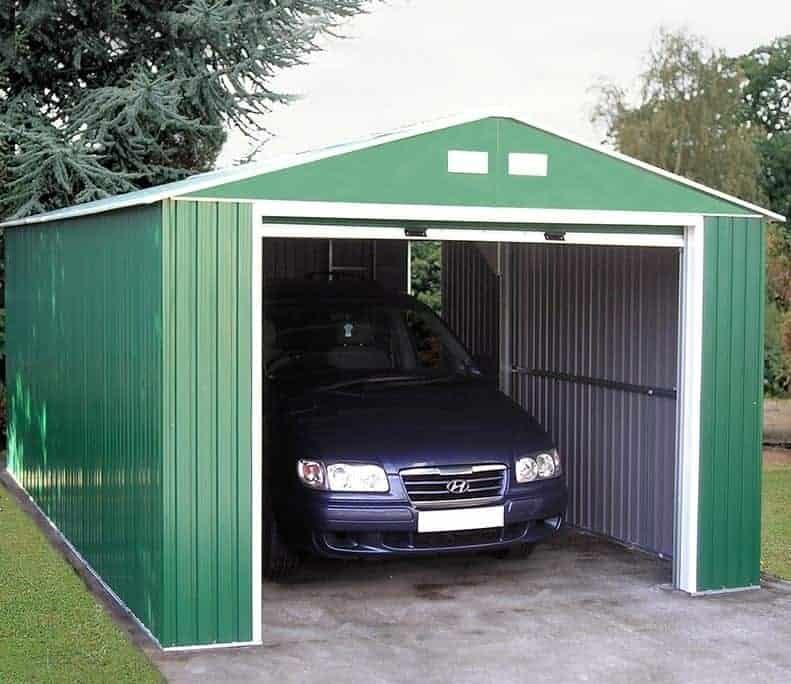 In fact, so roomy is it that we feel this would also make an excellent workshop for either a home or business, particularly as the rain repelling apex roof creates lots of headroom. To use it for this purpose you’ll need to add a secure locking system, which unfortunately isn’t included, and a source of lighting. There are no windows to allow natural light in, but we think this in itself is a useful security feature. Whilst there are no windows there are two doors: one large door that dominates the front, and a smaller personnel door at the side. 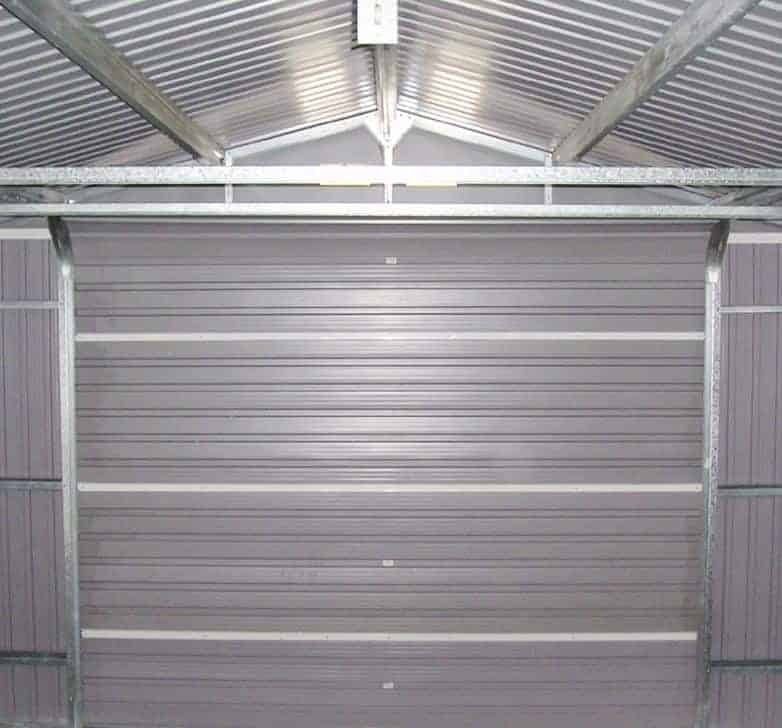 That means that whatever you use this tough galvanised steel metal building for, you’ll find getting in and out easy. 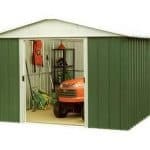 This large metal garage, like many others we review, features an apex roof and with a profile that’s much deeper than it is right. What made it stand out for us, however, was its attractive colour scheme of green and white. It not only looks good, which is a sign of the high quality we found right across the building, it also adds an extra protective layer against rain or snow. The apex roof itself is very tall, and the extra height it gives can be used for storage purposes whether you have a car parked inside or not. The ridge height it creates is 2.59m and the eaves height is 2.11m which is as tall as any that we see on metal buildings. The overall width is 3.72m but it’s the overall depth at 9.64m that we found particularly impressive. You’ll certainly need quite a large area of level concrete on which to site it. There’s always a danger that a building of this size can feel unstable or a little flimsy if the right quality and thickness of cladding isn’t used. Thankfully we had nothing to worry about here, with tough hot dipped galvanised steel used for the walls and the roof. It’s very tough, particularly when allied to the heavy duty frame, and yet it remains lightweight and easy to manipulate during assembly. As with all the metal garages we review this one has no floor, but unlike many of them it is also missing an anchor kit to screw it down to a pre-existing area of flat concrete. At this price, we feel that such an essential item should have been included. 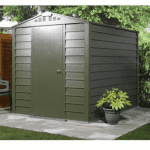 We feel that because the hot dipped galvanised cladding is so effective at keeping water out, a role which is also helped by the apex roof, this should be a very durable and long lasting shed. We were pleased to see that the manufacturers agree with this, as proved by the ten year guarantee that they provide against the appearance of perforations caused by rust. Given just how good the cladding is, however, we would have liked to see an even longer guarantee given. As with all metal buildings there are no treatment requirements for the owner to carry out, which will be a relief to people who’ve previously owned timber buildings. The door at the front of the garage boasts a typical roll up and over mechanism, but what is atypical is just how large it is. We were very impressed by its height of 2.05m and its width of 2.52m, making it much more accommodating than the doors on some garages and workshops we review. Equally useful was the tall side access door, and we liked the fact that it’s sliding mechanism is internally fitted to give it extra protection against knocks and potential intruders. There are no windows here, but there are large vents on the gables that allow lots of air inside, creating a pleasant atmosphere. 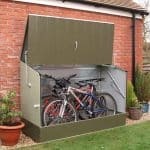 Having no windows is one of the best security features a garage can have, as it means that passers by will be unable to tell if anything valuable is stored inside. The very best security features, however, are missing, by which we mean padlocks and alarms. If you’re keeping cars or machinery inside then these really are an essential purchase, but unfortunately it’s left to the customer to source them separately. At least when padlocks have been bought, which doesn’t necessarily have to be an expensive purchase, they’re easy to fit, as both doors are ready to accept a padlock. One extra that can be purchased with the garage is a set of Hilti screws, but again we think that these are an essential purchase, so would have liked to see them included as standard instead of being offered as an add on. 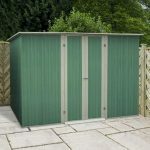 Priced at £19 for a set of 40 they make it easy to affix the metal garage itself to a concrete base, or alternatively onto a well sized and flat area of paving or patio. This garage not only looks high quality, it is high quality, and this is demonstrated by the use of hot dipped galvanised cladding throughout. 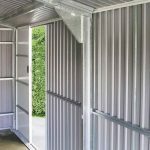 Good quality metal cladding, such as we found on this occasion, is very durable as it’s rot free and free from warping and splitting, as well as being guaranteed against rust damage for at least a decade. Whilst this garage doesn’t have the widest front we’ve seen, this is more than made up for by its very deep profile and its very tall eaves height. The only reason that this can take two people at least ten hours to install is because of its size, because the installation instructions are clear. Even though this comes with a hefty price tag, we still feel it represents good value for money as it’s large, durable, and attractive. 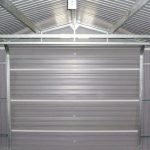 Final Thoughts: We found this large metal garage to be very versatile, and this will be even more relevant if an artificial lighting source is installed inside. It’s so deep that when a typical family car is parked inside, there’s still lots of storage space available. With the side personnel door giving unhindered access to this area, we can easily picture it being used as a storage space, and the building as a whole can be used as a well proportioned workshop thanks to its ventilation. At this price we would certainly have liked to see padlocks and a fixing kit included, but other than that this has a lot to recommend it.